In Year 12, it is important to be aware of what your assessments will be in advance so you can plan your study time accordingly well before the assessments are upon you. In this part of the Guide, we look at how many assessments you will face in Year 12 and what they will entail. 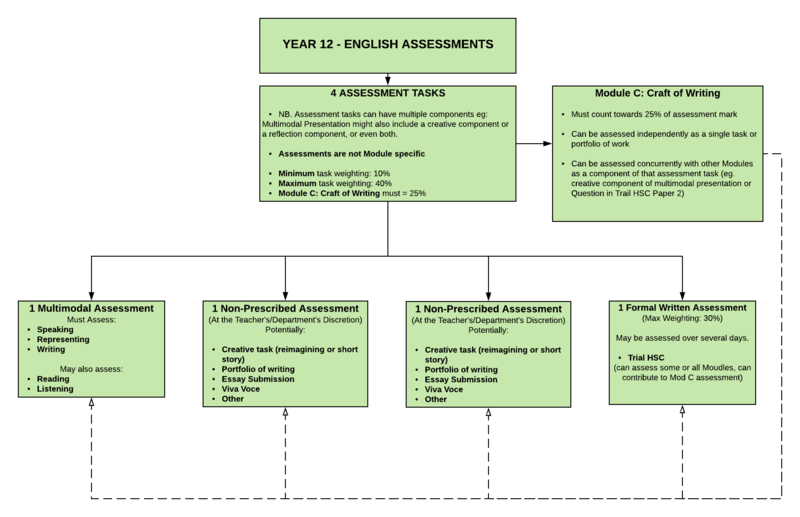 Have you planned out what assessments you have, when they are, and what Module they are for? You’re not alone. What are the Year 12 assessments? In this final part of the guide, we’ll give you an overview of the Year 12 English Assessments and different parts of the HSC for the 2019 syllabus. Students in Year 12 often lose sight of the bigger picture and don’t think about how all of their assessments fit together and how they should plan ahead to deal with them. This is especially true of the new cohort sitting the revamped HSC for English. Most students get caught up in the immediacy of Year 12 and end up being reactive rather than proactive. To succeed in Year 12, you really need to be on top of your assessments and schedule from day one. This may sound daunting, but we have your back. Year 12 assessments are made up of internal and external assessments. The external assessment is the HSC which is comprised of Paper 1 and Paper 2. Your internal marks comprise 50% of your HSC Mark and your HSC Examination result comprises the other 50% of your HSC Mark. Your HSC mark will determine which performance band (out of 6) you will be placed in. Which Assessment will I get for which Module? That’s up to your school’s teachers and English Department. NESA does not mandate which assessment will be had for which Module. The only thing you can take as a given is that Common Module, Module A, and Module B will be assessed in your HSC Trial Exam, while Module C may be assessed also. This means that there may be inconsistencies between schools as to what Module will have a multimodal presentation or what you will do for Module C assessments. Because Module C can be assessed concurrently with other units, you may well face assessments that come in several parts. Write a creative reimagining of a scene from Nineteen Eighty-Four to be handed into your teacher (10% for Module C). In addition, you might be asked to present your creative with earlier revisions demonstrating your drafting and editing process. This is a complex task, that would require a significant amount of work. Fewer assessments do not mean less work. If you would like to know more about HSC marks, scaling, and learn how your ATAR is calculated, you should read our Beginner’s Guide to ATAR and Scaling. If you want to work out what marks you’ll need to for the ATAR you’re chasing, you should use our ATAR calculator. All HSC students sit an HSC Trial examination. This is essentially a dry-run of the HSC that carries a much smaller weighting than the proper HSC Exam. Paper Two which will assess the other Modules you have completed. The Trial papers will have the same structure as the HSC Paper which we will discuss in detail below. Paper Two which addresses Modules A, B, and C.
Let’s have a look at what is involved in these papers. Paper One has two sections, all of which are focused on the Common Module. Each section assesses a particular skillset – essay writing and comprehension. Students receive 90 minutes of writing time and 10 minutes of reading time. This paper is worth 40 marks. Section One – This is the comprehension and short answer section. This section will comprise a number of written and visual texts. Students will get 10 minutes reading time, they will then have 45 minutes to answer a series of questions on the texts. This section is worth 20 marks. Section Two – This is the essay question. There is one question for the entire range of CM texts. This question is usually drawn from the CM rubric and is comprised of two statements and then an instruction. Students have 45 minutes to write this response. It is worth twenty marks, also. It is not a good idea to memorise an essay for this question as it will draw on random parts of the syllabus document. We’ve produced a practice Paper 1 that you can download, here. We’ll send you the marking criteria and sample answers after you’ve had a day to complete it, so you can see how you went. If you need help getting your head around the unseen questions in Paper 1 Section 1, read our Ultimate Guide For Answering Common Module Unseen Questions! Paper Two also has 3 sections, each section focuses on a different Module. Students will get 5 minutes reading time and 2 hrs writing time. This equates to forty minutes per section. This paper is worth 60 marks. Section 1 – A question on Module A. There is one question for each text pairing. This is normally a very specific question on a contextual theme in your comparative study. Band 6 essays are usually very specific and clearly written specifically to answer the question. Section 2 – A question on Module B. This is a text-specific question, too. These questions are usually very different. While the questions will follow a pattern for the different texts, each question will be very specific to a particular theme in an essay. These questions will often ask for themes that are not major and will require critical thinking to answer. Section 3 – A question on Module C. Module C questions can take a variety of forms. You may be asked to write a creative or a discursive essay or, even, a persuasive essay. You may have the choice. You may be told what form to write in. In addition, you may be asked to write a reflection or rationale where you explain your choices as well. Because 2019 is the first cohort sitting this section, there are no historic HSC questions you can see as examples. However, in our discussion of Module C in the Year 12 English Study Guide, we break down the sample questions NESA has provided. Stage 6 English is large and complex. To be successful students should take advantage of as many resources as they can. Below are some free external resources that Matrix English Teachers and Students recommend. The Write Site – The University of Sydney Writing Lab hosts the Write Site. It is an interactive website that has exercises on essay structure and some common grammatical problems. For Better, For Verse – The University of Virginia English Faculty manages this site. It is the best resource on the internet for learning about scansion and how to read the meter and rhymes of poems. It’s interactive and will teach you skills that will give you an edge over your peers. Purdue OWL – Purdue University English Department’s Online Writing Lab (OWL) is a great resource to help students understand grammatical issues and sentence structure. It has a variety of interactive exercises. Virtual Library – An excellent and comprehensive research library for Australian students curated by teacher librarian Cathy Costello. This site has some excellent HSC resources for a variety of subjects. Poetry Foundation – The Poetry Foundation has a wonderful selection of online educational resources to help students get to grips with poetry and poetic techniques. Charles Sturt University – CSU has a great repository of HSC guides and resources. We hope you found this guide and the links provided to be a useful resource for aiding your English Studies throughout Year 11 and 12. Matrix hopes that you are successful in achieving your academic goals for English for the coming year. Want to rewrite your English Mark? Get insightful and actionable feedback on your work every lesson. Click here to learn more about the English Advanced Common Module Course.